Unidentified Pottery Mark - helmet with six crossed arrows, ribbon scroll and beaker. :- Hi, A friend gave me a pair of trios she found at a bric a brac market in Greenwich. It's a lovely hand-painted set with a very pretty shape - the cup is shaped into quadrants and the saucer and plate have a patterned edge. The china is quite fine - I hardly dare touch it! Apparently it came from a house clearance somewhere in south east England, but further than that I know nothing about its history. We were trying to work out who the makers were - there is a pottery mark on the bottom of the pieces with what looks like a pith helmet (or possibly an archer's helmet), six arrows crossed and pointing downwards (three on either side) with a ribbon or scroll at the meeting point, then there's a curved bar and at the bottom of the mark is what looks like a full beaker or cup. Then, in red, are the numbers and letters: 42SV with 49 beneath. I've searched the internet and Peter's brilliant website but the only hits I've had for crossed arrows are for Kalk and Arnart, but those show two crossed arrows rather than six. I love trying to find out the history of pieces of china I'm given - brings out the researcher in me! But I'm annoyed that I'm so stumped with these lovely pieces. If anyone can help identifying the mark or the pattern - I'd love to hear from you! There is no sign of this mark in any of my books or online, and I can't recall ever seeing it before. There are no words or initial at all the help our quest for identification, so this a tricky one indeed. Let's look a the cups first. In terms of design, they could be English or European, so no clues there. They are obviously a type of fine porcelain, but this could be somewhere to look for clues. Bone china (a type of porcelain with animal bone added) would very likely be English. Porcelain would be European. Bone china, on closer inspection is whiter than porcelain. Porcelain has the slightest grey or bluey hue to it. The purer the whiteness, the more likely it is to be bone china and therefore English. Now, your theory about an association with archers. 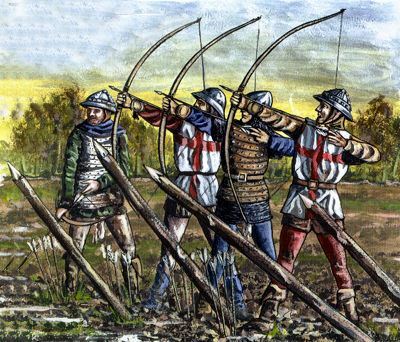 I Googled what English longbowmen wore and came up with this image from listverse.com/medieval-soldiers. Note the English red cross of St George tunics, denoting they are English Longbowmen as distinct from other nationalities. The helmets look the same type as on the pottery mark. So I think we can conclude from this evidence the trios might be English rather than continental, which narrows it down slightly. The only other thing I could think of to research was, to whom might the longbowmen symbol be significant to? The answer to that is almost anybody as archers were very widespread across England and Wales. So the other avenue is to look at the 6 crossed arrows. I found that the six crossed arrows were used in crests or coats of arms of the following families:- Bavent, Bowes, Dove, Keyne and Segrave. None of these were famous potters, so we have drawn a blank so far. If anyone knows anything about this mark, please post below. 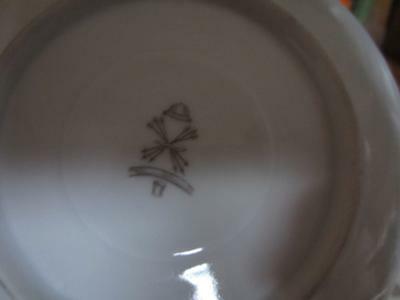 Comments for Unidentified Pottery Mark - helmet with six crossed arrows, ribbon scroll and beaker. Delighted to see this query. I have two China plates with the same backstamp as above. Pattern on plates is largely in green, depicting flowers, probably Irises. I should also mention that Sue of London submitted the query on the above cryptic backstamp, and I have no information to add. I would be so grateful for any further information. I have my Grandfather's shaving mug which has these same marks on the base. My Grandfather's family came from Ireland and my Grandfather died in 1904. Although I have asked some people about this mark no one has been able to enlighten me. 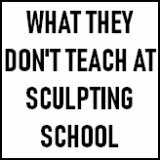 I was so excited to find this article on the web page and would love to hear any more information about the mark that comes to hand. I have just acquired four plates with the same backstamp and so was very interested to find out more about them. After comparing them with some English china, I have concluded that the colour has a blue/grey tinge, and so, perhaps more likely to be Continental. We also bought a number of other similar style pieces from the same person, which had Bavarian/Austrian backstamps. I too have the same mark on several plates which are very unusual in shape with delicate holes on the edge at one side. There are pink painted flowers and gold detailing on raised patterned lines. I also have several plates the same desighn on a raised stand like mini cake stands. 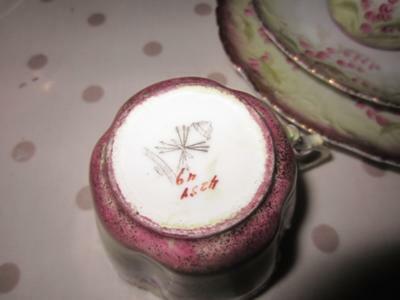 I have just been asked to identify this mark on the back of a very pretty and delicate teaset which was donated to our charity(Whinnybank Cat Rescue, Newburgh, Fife. 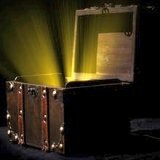 )I have had no luck so far but am intrigued to find so many examples on this page!! Hi - thank you everyone for commenting on my original query. And Greg - thank you particularly for yours. I've now spent more time comparing the cups with other stuff in my collection, and yes, I would agree with you that when compared to something I know to be English bone china, there is a slight bluey tinge. Do you have a photograph of the Bavarian/Austrian backstamp from the other pieces you have? It might help me narrow down my search. Would appreciate any photos Greg has, or anyone else. Commentators can't upload photos themselves, so please just send them to me and I will manually add them to your comment. Here's my email address (please state clearly they are for ("helmet with six crossed arrows, ribbon scroll and beaker" page in the forums, otherwise I will get confused). We need to solve this one, just like we have solved many other mystery marks on this site. I want to eliminate one possibility. So does anyone have any evidence of items with this mark having been in the family for more than, say 10 to 15 years? Recently we solved an old looking double lion pottery mark on some beautifully made high quality items which looked very old and genuine. Turns out although they were lovely quality and very genuine looking, they were actually designed and commissioned by a high class Italian reproduction manufacturer who have their ranges made in the Far East and sell them at wholesale prices to retailers. This firm has a website and they sell every type of reproduction antique from furniture to fabric, wallpaper and fine china. There are clues that this make is a similar thing. The fact that the pottery mark appears to be English looking (English helmets and so on), yet the porcelain is continental (bluey hue). I just want to eliminate possibilities one by one, so need to know if anyone knows for sure this mark goes back in time to older times. Paul J Has Found the Answer!!! I've just found an invalid feeding cup with this mark. I found the mark in an 'Porcelain Marks Of The World' (Emanuel Poche HAMLYN 1979). It's MITTERTEICH C1900. From there I found plenty about it on the web. WOW! Paul J! How can we thank you. This is one of the longest running mystery mark queries on this site. I checked with the ever faithful German expert specialist site PM&M site who confirm this mark and show it. This flags up my frustration with good old PM&M in that if you put the words "helmet crossed arrows mark" into their in-house search engine, you come up with "no searches found". In order to find the mark within that site, you first have to know which region of Germany the mark stems from. And, of course, all the searching person ever knows is that the mark is a "helmet crossed arrows". 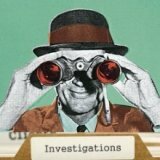 Therefore the excellent information on that otherwise excellent site will remain forever hidden until someone like Paul J comes along to this site and makes a post. Now when someone puts a search term into a search engine with the words "helmet" and "arrows", they will find this site, which gives the answer. The company was started in 1867 by Ludwig Lindner in Mitterteich, Bavaria. The company was taken over in 1895, interestingly by a London based company called Max Emanuel & Co who was a successful British retailer. The helmet with crossed swords mark was designed and used only during this trading period of British ownership (1898 to 1917), so maybe it was an attempt to look more English in tradition (just a very speculative guess on my part). Thanks for your help solving this little mystery - I really appreciate it! I have a very old pink flowered plate with gold trim that has the helmet, two swords and a banner marking that says Warwick. Is this the name of the company? No Ann, if it has this mark it is Mitterteich as described above. The word Warwick must be the pattern name. Remember, this maker was owned by a British retailer (explaining the British Archer references in the mark). The point is, at that time, German porcelain was in general higher quality and cost less than British porcelain. A good option for a fine china retailer was therefore to own a German unit, rather than sourcing from Staffordshire, Worcester or Derby. However, it was less patriotic, so British references on a mark was a good marketing move. Hi, we have a similar plate to those which Sue describes. Ours is painted with Daisy's and has the arrows under helmet mark, with what I assume is the pattern number beneath in black (5080), with a further mark below, (45). I have been unable to identify the design by googling Mitterteich. It was a giftfrom a friend and we would love to find out more. My tea is over 100 years old. 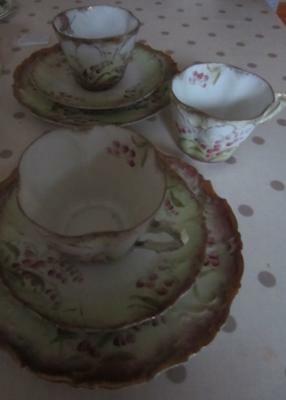 It has two cake plates,10 cup saucer and plates, also sugar bowel and cream jug. It is white with pink flowers and gold trim. This all belonged to my In-laws, from Ireland and England. I have a beautiful plate with the same marks, also has 4619 in red with 45 under it. Plate looks hand painted with flowers a white centre and pink outside with gold flowers over the pink. Thank you for all this information. I bought my mum a really pretty small yellow cake stand, with pink flowers on it for her 92nd birthday. I was intrigued by the mark, which seems quite complex. Good to know where it came from. Thanks for the comment and a happy birthday to your mum.